Samsung is out to create as many Galaxy devices as stars in the actual galaxy. We finally got our hands on the previously announced Galaxy S4 Mini and Galaxy S4 Zoom, as well as the just-unveiled Galaxy NX, an Android-powered interchangeable-lens camera with 3G/4G/LTE and Wi-Fi that gives new meaning to the passé term "cameraphone." Following a wild slate of Galaxy extensions and releases over the past year, Samsung's head of sales and marketing, DJ Lee, announced on Thursday that with the advent of the Galaxy S4, the waterproof S4 Active, the petite S4 Mini, and the crossover S4 Zoom, the "Galaxy S4 line is now complete." We'll see about that. In the meantime, I got a chance to play with the smallest member of the family: the diminutive S4 Mini. The term "mini" may be a bit of a misnomer; it isn't that noticeably different than its beefier cousin. The Mini still carries a respectable 4.3-inch display, compared to the full-throttled S4's 5-inch screen, and it is only lighter by 0.06 pounds. 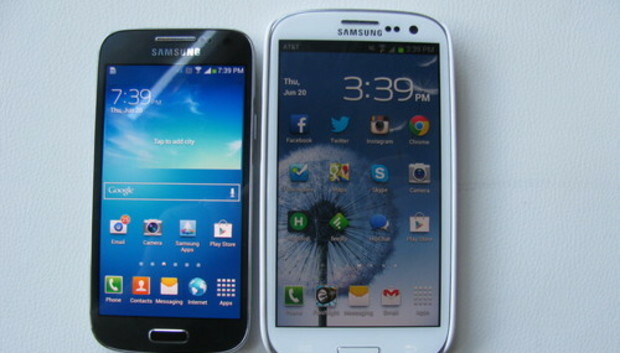 Still, for those with certain expectations for how a Galaxy should feel, the smaller phone may take them back. In my daily life, I use a Galaxy S3, and despite the relatively small weight difference, the feathery Mini felt like it was barely there. The Mini is still a top-tier smartphone, but aimed at midrange consumers. Inside, the Mini boasts a respectable 1.7GHz dual-core processor and 1.5GB of RAM. Those who already use the full-throttled Galaxy phones (for the record, the full S4 has a 1.9GHz chip) may notice the slightest of lags in performance. But really, I can't imagine that many users who are already devotees of the plus-sized Galaxy handsets would care to trade down to the Mini. The Mini is expected to hit U.K. shelves in July. No word on availability or price for a U.S. version. The Galaxy S4 Zoom is a smaller cousin of last year's Galaxy Camera and resembles a Galaxy S4 Mini except that it has a retractable 10x optical lens on its back--Samsung claims it's "the first phone" to have that function. Like the Mini, the Zoom has a 4.3-inch display, 1.5GHz dual-core processor, and 5GB of internal storage. Unlike the Mini, the Zoom boasts a 16 MP sensor and Xenon flash, which, Samsung says, is better for low light than the LED flash used on most phones. That lens's retractable focus wheel can even be used as navigation input for the device. No doubt the Zoom will take far better pictures than the average smartphone. However, it has the same light plastic material as the Galaxy S4, so it certainly doesn't feel like a camera. It's very dainty and doesn't have that optical camera oomf. One of the cooler functions (which was unfortunately not available in the display models) was "in-call photo share" that will let you take a photo during a phone conversation, and send that photo directly to the person you're talking to. Optical zoom or not, this seems like a function that all smartphones should have. The phone also boasts an optical image stabilizer, which can create superior images compared to the digital image stabilizers available in most smartphones. While the Galaxy S4 Zoom is generally aimed at non-professionals who want a phone that can take above-average photos on the go, the Galaxy NX is a mirrorless camera aimed squarely at pros. This spec-tacular camera just happens to run on Android and have 3G/4G/LTE capabilities in addition to Wi-Fi and Bluetooth. The NX just looks and feels like a professional camera. It has all the same guts as the Samsung NX 300, plus additional smart capabilities. The Galaxy NX can connect to Samsung's wide range of interchangeable pro optical lenses, while its Wi-Fi and cellular connectivity lets you share images just as easily as if you were using a smartphone. The NX boasts a 4.8-inch HD touchscreen display that you can use as a digital viewer, and the display ingeniously shuts off when you bring your face close enough to use the analog optical viewer. It's powered by a 1.6GHz quad-core processor in addition to a separate DRIMe IV Signal processor for imaging, and it has hybrid autofocus and a shutter speed of 1/6,000th of a second. I'll admit I'm not a professional photographer, but swiping through the UI, I'm sure the experience will be familiar to anyone who has used an Android device before. It's got the usual apps, including the standard "camera" app available on all Android phones, on a handy touchscreen interface that will allow your serious photographer friends to pump out gorgeously processed Facebook and Instagram photos to put yours to shame.